Art Deco wedding ring sets are an elegant combination of both contemporary and classic designs. With their distinct, geometric lines, a sleek look, white metal settings, and elaborate carvings, these wedding sets are timeless in their appeal. You can find both vintage sets as well as modern reproductions. Vintage Art Deco rings are popular wedding set options. You can often find these rings at traditional and online antique stores and estate jewelry shops. Since many antique rings are one-of-a-kind, it may take a while to find the perfect set. If you see something you want, contact the seller immediately. If you wait too long someone else may end up wearing the rings you fell in love with. Antique Jewelry Mall features a large collection of vintage wedding ring sets done in the Art Deco style, as well as new sets crafted to look resemble these vintage styles. This site has vintage and vintage-look ring sets priced from under $500 to over $2,500, making it an ideal shopping option for any budget. In addition to diamonds, many of the rings available through Antique Jewelry Mall feature gemstones like sapphires and rubies. With an ever-changing inventory of vintage pieces, there is always something new to find. Antique Jewelry Mall offers free shipping for all purchases. The retailer has a 45 day return policy and offers a five percent military discount. Ten Two Three has a large selection of vintage bridal sets priced from $1,500 to $2,000. Since the wedding sets are unique vintage pieces, the site's inventory is always changing as items are sold and new ones are introduced. Many vintage sets feature 14k white gold settings and brilliant cut diamonds. All sets sold on this site are in excellent condition. Ten Two Three offers free shipping on purchases over $99 and offers a money-back guarantee, minus the cost of actual shipping expenses, for jewelry items that are returned within seven days of receipt. Complimentary ring resizing is provided for purchases over $400. Customers may choose to utilize the site's 120-day interest-free layaway plan. Lang Antique and Estate Jewelry features a selection of vintage wedding ring sets. You can expect to find Art Deco rings priced around $3,000 to $4,000 depending on the type of metal they are set in and the size of the stones. In addition to diamonds, many rings available here have gemstones such as emeralds, sapphires, onyx and aquamarine as part of their design. Jewelry purchases over $2,500 include overnight shipping with insurance. There is a 10 day return policy for online purchases. However, there are no refunds for purchases made in the company's store location in San Francisco, California. Jans Jewells carries a lovely selection of Art Deco style wedding sets. All rings can be returned for any reason for 14 days after delivery. In addition, this jeweler offers a lifetime warranty against manufacturing defects. Rush and next-day delivery options are available as well. The site also offers engraving for an additional fee. 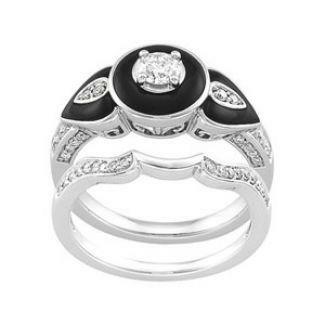 Art Deco Onyx and Diamond Wedding Set: This set is done in 14K white gold. The engagement ring features an inlay of black onyx and a .50 carat center diamond. The wedding band is a 2mm wide fitted band with pave set diamonds. This set is stocked in a size 7 but can be special ordered in other sizes. It is priced around $2,100. Art Deco Rectangular Onyx Wedding Set: This set is done in 14K white gold and features an engagement ring with a round brilliant diamond set in a rectangular shaped black onyx and surrounded by round diamond accents. The band is done in a 2mm wide style.This set is priced around $1,800. While Jans Jewells doesn't have a retail location, all of the designs are available online. This jeweler has received positive comments from the press, and many pieces from the site have been used as props in movies, television shows and theatre productions. deBebians carries a collection of bridal sets inspired by the Art Deco era, many of which are are hand-engraved and feature filigree and open-gallery detailing. Most rings feature diamonds and gemstones such as blue sapphires. Rings can be set in your choice of gold or platinum. deBebians is fully-insured and offers free FedEx shipping, 30-day return and exchange policy, free appraisals and a certificate of authenticity as well as a lifetime guarantee. In addition, this jeweler gives military discounts and does not charge sales tax outside the state of California. The Bel Dia Luxury Collection is one of the most popular vintage-look collections available from deBebians. It puts a modern spin on classic styles, including the following Art Deco bridal sets. Canary Diamond Art Deco Wedding Set: Priced around $3,700, this set features an engagement ring done in a halo style with a split shank and a canary diamond center. The diamond-twist band is designed to fit perfectly against the engagement ring. deBebians has positive feedback and comments from a large number of past customers. Reviews and testimonials rave about the unique designs, outstanding work and excellent customer service. Fay Cullen is located in Asheville, North Carolina and has a beautiful selection of vintage-inspired wedding ring sets both in their retail location and online. Fay Cullen offers a layaway plan making it possible to make payments on a ring. The jeweler also offers an Extended Care Jewelry Plan that covers all inspections, cleaning and repairs and services if needed. Special order rings are non-returnable and non-refundable since they are made to order. 6021MD: This Art Deco set is available as a special order. It is done with a center diamond and colored gemstones of your choice. You can choose accent stones such as sapphire, ruby, pink sapphire, emerald and aquamarine. This set comes in your choice of platinum, 18K or 14K white gold. This ring set is hand-engraved and features details such as mirrored cascading rows of tapering baguette stones and a a contour-fit wedding band made to fit the engagement ring precisely. 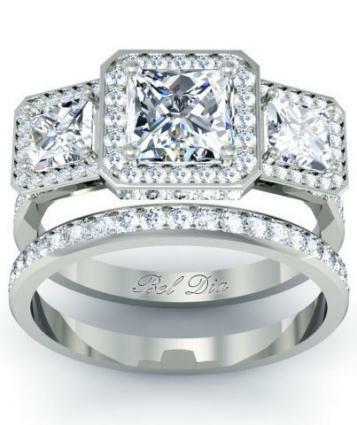 The engagement ring features a center mounted diamond with ribbed prongs and a pave-set diamond crown. A set like this can cost close to $4,000, though the price can vary significantly due to your specifications. 2026MD: This set is done in a unique Art Deco style and is available as a special order. It features an engagement ring done with a large center stone circled by 13 smaller stones. The mesh wedding band is done in a perfect contour-fit and is done in a high-polish finish. 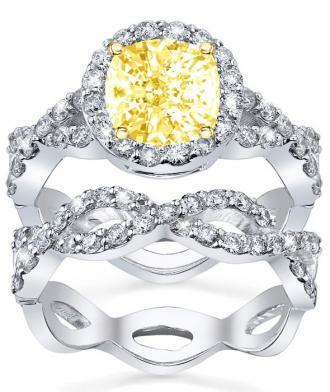 This set is priced around $2,700 and can be created in your choice of 18K or 14K white gold. Fay Cullen has received positive testimonials from many past customers. Customers praise the jeweler for the professional service they received, the quality of the pieces, quick turn-around time, and the superior customer service. Art Deco ring sets are done in timeless styles that are unique and eye-catching. With a variety of options to choose from that can match any budget and style, there are many vintage and new options for any bride-to-be to consider.